You’d think that a person’s centennial, even a posthumous one, would be easier. The long-awaited newly revised Peterson Field Guide to Birds of North America is released to the avid masses almost 100 years to the day after the Great Man himself was born and yet, the world did not spin off its axis. Humankind was not suddenly imbued with the innate ability to identify all North American bird species by scent or the rustling of their feathers as they fly overhead. Heck, I’ve heard that some birders didn’t even burn their now superfluous libraries in a pyre of Peterson purification. What is a birding legend to do? The Peterson Field Guide to Birds of North America is just a field guide, not the second coming of Roger Tory Peterson himself. 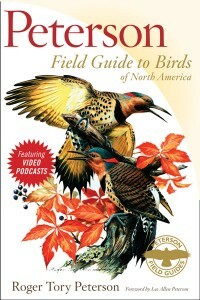 Of course, it is an excellent field guide, one that every birder is going to want on the shelf. Beginning birders in particular will appreciate the myriad ways in which RTP and his more contemporary colleagues make avian identification more accessible. But the guide is not the man and, more important, the man is not the guide. One can imagine that, considering the incredible esteem in which so many of us hold the King Penguin, there isn’t a work on this Earth that could live up to the impossible expectations. Some readers may not realize Peterson’s venerated position in the pantheons of birdwatching and conservation. Here’s our opportunity to set the record straight! 10,000 Birds has the privilege, thanks to our dear friends at Houghton Mifflin, of giving away two copies of Peterson Field Guide to Birds of North America. One giveaway will be a birding challenge worthy of any who has followed in RTP’s path in cultivating an uncanny eye for American avifauna. I’ll get to that one later this week. This first one, however, will be much easier. All you need to do to have a shot at a FREE COPY of this important North American field guide is to say something nice about Roger Tory Peterson. Think you can do that? In the comments below, write a single sentence beginning with the words “Roger Tory Peterson” continuing on to a historical fact or personal opinion about him. Your sentence must be original (not a copy of another one in the comments,) factually accurate, and in good taste. One random participant will receive a copy of Peterson Field Guide to Birds of North America but we’ll benefit from this lesson in a long life devoted to nature. The deadline for this contest is 11:59 PM Eastern Standard Time on Wednesday, September 10. On Thursday, I’ll reprint all of the entries together and announce the winner. So educate, inform, or entertain but please say something about the Great Man, Roger Tory Peterson! conservationist, birder or nature lover aspires to. What a wonderful gift has Mr. Peterson given to the birding community! Roger Tory Peterson was the first Saturday night keynote speaker at the Rio Grande Valley Birding Festival and was Peter Jennings “Man of the Week” that week. I remember when Roger Tory Peterson gave a lecture for the Cincinnati Zoo just a few months before he passed away. My buddy and I were working in Indianapolis and took off work early to attend the lecture. We were stoked to see THE MAN! I took my worn out old nasty field guide my mother gave to me when I was young to get it signed if possible. We were late so therefore we were seated in the back and consequently last in line for signitures. When we finally got up to him and his wife he looked at my field guide, then looked at me, then back to the guide and then smiled and said “this is the way this guide was intended to look, very well used.” After a handshake and thank you I left with a feeling that can and will never be taken from me. To get that sort of complement from Roger Tory Peterson is unparalleled. Thank you Roger… I am honored to have mangled your field guide while birding these great United States!